Living… in Philadelphia. In contrast to his best friend Shawn Hunter, Cory comes from a relatively well-adjusted, warm and strict household. His father Alan has a quick temper but is always present to offer guidance to Cory and his older brother Eric. His mother Amy worries about Alan “coddling” the boys, and she in turn plays the role of disciplinarian. His brother Eric’s presence is a mixed blessing, as he’s never really been much of a role model, but is always there to offer his brother an older perspective, however skewed it may be. Profession… high school student. Like his best friend Shawn, Cory pays little mind to his schoolwork, despite being relatively bright and capable. They’re initially more concerned with being cool and popular, a goal more easily achieved by Shawn than Cory. Slowly, with the painstaking efforts of his teachers Mr. Feeny and Mr. Turner, Cory drops his pretenses and invests more in his education. Interests... sports and hanging out with his friends. Relationship Status... in a relationship with Topanga Lawrence. Cory has been in love with Topanga from the time he was six years old, when they were in his backyard collecting fireflies. Back then, he could only express his feelings through insulting and teasing her. But deep down, all he’s ever wanted is to talk to her, make her laugh and take care of her. Their many fights have only served as confirmation that there is a real connection between them worth holding onto. He rarely gave thought to anyone else all throughout high school. Challenge… moving into the future with a clear and optimistic mind. 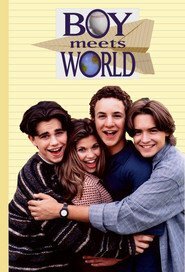 Cory is a bit of an idealist in matters of love, often overthinking things – especially when it comes to his relationship with Topanga. They’ve had fights and taken breaks, simply over the suggestion that they might be in a rut. Inevitably, Cory realizes he was wrong and that she’s the one for him, and they reconcile. But with high school ending soon, things are becoming unsure and terrifying. Personality… witty, goofy, neurotic, and always willing to poke fun at himself. Friendly and approachable, Cory is very dedicated to his friends, family and girlfriend, often putting their happiness before his own. He’s the guy who wants everyone to be happy and will put in the legwork to make that happen. Cory Matthews's popularity ranking on CharacTour is #1283 out of 5,000+ characters. See our top-ranked characters and read their profiles.